Valora Kikyo villa project of the Nam Long Group is a project worthy of attention from investors and people who want to settle in Saigon. With the criteria to bring a modern, convenient, but comfortable, cool, harmonious living space, Valora Kikyo is the lucid choice for you. The highlights of the Valora Kikyo project that you interest in. After successfully opening for sale the Valora Fuji villa, Valora Kikyo is a classy villa that Nam Long Group together with two partners from Japan (the leading real estate companies in Japan) will deploy to build in the center of District 9. Considered as version 2 of the Valora villa brand, the Valora Kikyo Villa inherits many advantages from its prime location, superior service, utilities and reasonable prices. Valora Kikyo promises to become the most prominent villa in the East of Ho Chi Minh City. Proudly it is the leading real estate developer in Vietnam, Nam Long is a brand that has 23 years of experience, always understands and meets the best wishes of customers. Nam Long always stands in the top of the real estate developers in Vietnam from urban development to the product line “affordable housing”. In Nam Long, the professionalism is reflected in project management, financial management, marketing, product sales… with staffs, organizations are willing to receive, take responsibility, and have intellect and leadership capacity. With that strength and belief, Nam Long can expand the view and join the ranks of companies worth billions of dollars. Development partners along with Nam Long including Han Kyu, an interdisciplinary corporation based in Osaka (second largest in Japan), has 108 years of experience, with 86 subsidiaries and annual revenues of $243,478. Along with Nishitetsu, the interdisciplinary corporation based in Fukuoka (fourth largest in Japan), has 107 years of experience, 80 subsidiaries and annual revenues of $121,739. That is why Valora Kikyo is considered one of the projects that own the most interconnected location in the Eastern market. The Valora Kikyo Villa is built on affordable resort villa trend. Isolating design standard is fixed to the standard of one floor and one ground floor. 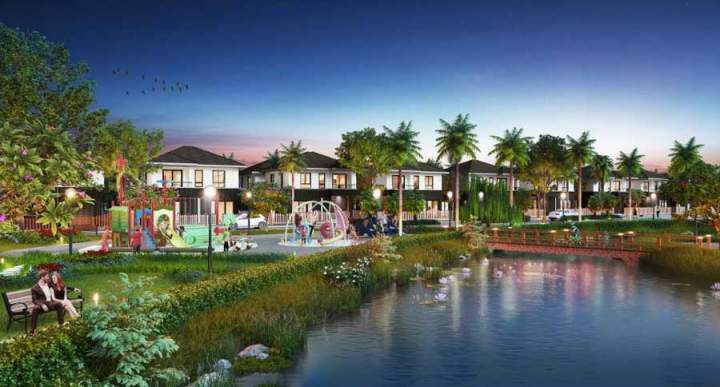 Valora Kikyo is affirmed to be a high standard planning villa project, which connects the internal infrastructure with various utilities to create a residential community of the same level. According to the standard premises sent to the construction office for approval, Valora Kikyo is adjacent to the international standard school up to 5 hectares. The school system at Valora Kikyo Villas is planned for two levels of preschool and elementary school with high standard of training. Thus the Valora Kikyo villa is very suitable for intellectual young families, creating the most favorable conditions for the development of the children of the villa. Valora Kikyo Villa is estimated at between $230,000 and $261,000 per unit, including house and land. The support bank is expected to be Vietcombank (a unit that has worked with Nam Long through many projects). In addition, interest rates may be adjusted slightly.